Cause of his death was consumption. 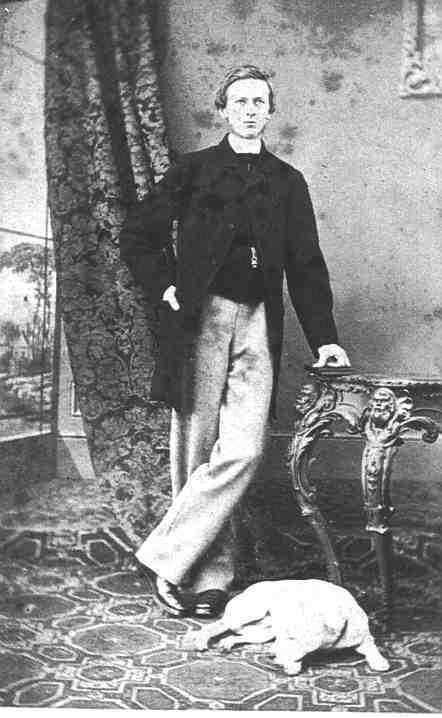 George Frederic Julius Heaton Julius born July 7th 1842 at Richmond Surrey about half past six in the morning. Baptised the same day by Edward Hoare curate of the Old Church Richmond. George Frederic Heaton Julius was christened at the Old Church Richmond (having been baptised at home previously not expecting the child could live) Rev. Edward Hoare, Dr Julius and Lady Shaftesbury sponsors Mr Hodgson and Frederick Gilder Julius stood proxy. Julius Jottings No 4 Jan 1901. George Frederick Heaton Julius, who was always very delicate, studied at Kings College London, and took his degree at Edinburgh. He was threatened there with consumption and sent to Australia where he died September 29, 1865 aged 23, unmarried. The following gentlemen having undergone the necessary examinations for the diploma were admitted members of the College at a meeting of the Court of Examiners on the 19th inst, viz: . . . . . George Frederick Heaton Julius, Richmond (student of Kings College).. . . . .
Ref: London Daily News 20 November 1863. A Mr G F Julius aged 20 sailed on the Alexandra l to Sydney from Melbourne in May 1875. Administration of the effects of George Frederick Heaton Julius late of Richmond Surrey, Surgeon a batchelor who died 29 Sept 1865 at Heidelberg Melbourne Vic Australia was granted to Arthur Onslow Julius of 15 Finsbury Circus solicitor next of kin and one of the exors of the Will of Frederick Guilder Julius the father at L1148 2s 7d. It was with great pleasure I received your letter this morning informing me of the welfare of Sally and of your success at school. It was very kind of Mr McEwan giving you so many holiday tasks I suppose he knows your propensity for mischief and the difficulty you experience of finding employment during your holidays. I should think you are very sorry that Philip is not coming back again he was such a cheerful companion for you to play with and took such care of you when at school. I hope you have not been fighting anymore with your schoolfellows and got another black eye or scratched cheek. So that you see you have very good authority for living peaceably with your fellow creatures. I am not answerable for the correctness of the quotations. And as perhaps I shall not have another opportunity of writing to you before Christmas Day let me warn you against the danger of eating too much plum pudding on that day lest you should the the unpleasant sensation of the boa constrictor after having eaten his blanket for dinner you will generally find at least I have found it to be my own experience that it is always time to leave off eating when the upper buttons of your waistcoat give way or at least when it feels as if it was buttoned and it is a dangerous practise to endeavour to eat a little more by unbuttoning it or by standing up and if by accident you do burst dont say it was my fault.